This cartoon grew out of the study of different constitutional theories of abortion rights, some better known than others. The First and Second Amendments of the Constitution have infiltrated the popular imagination, but the Third -? What is the Third Amendment, anyway? Frame 1. The soldier in the title frame is General John Burgoyne, as shown in his portrait by Sir Joshua Reynolds, c. 1760. Frame 2. Justice William O. Douglas first articulated the Privacy framework in the case of Griswold v. Connecticut (381 U.S. 479 (1965)), which concerned not abortion rights, but the right of married couples to use contraception. As Privacy is not a right specifically named in the Constitution, Douglas introduced the concept of a penumbra, a cloud emanating from the Bill of Rights, chiefly the First Amendment. Privacy was defined as preventing the government from interfering with marital privacy. This protected area was later expanded to rights to contraception for unmarried people, and then to abortion rights (see Roe v. Wade, 410 U.S. 113 (1973). Frame 4. According to the History Channel, the photo of African-Americans in the cotton fields represents a “slave family standing next to baskets of recently-picked cotton near Savannah, Georgia in the 1860s.” The realities of slavery with respect to women’s reproduction has been ably addressed by Dorothy Roberts and Rickie Solinger, who discuss both the coercive nature of these women’s pregnancies as well as their subjugation to the role of producers of future slaves. The connection to abortion rights is the Thirteenth Amendment, which forbids slavery and involuntary servitude. Legal scholar Andrew Koppelman, in his 2012 article, “Originalism, Abortion, and the Thirteenth Amendment,” draws an analogy between the forced labor of slaves, including their forced reproduction, and the forced labor of women compelled by abortion bans to carry their pregnancy to term. Of course, Koppelman is not claiming that absence of abortion access is equivalent in severity to the past system of slavery in this country, only that both issues can be seen as a violation of the Thirteenth Amendment. Frame 5. The crowd at the 2004 March for Women’s Lives seems puzzled by the Third Amendment. The photo of the march by Bubamara, shared under a Creative Commons license, is augmented by an airplane towing a “Keep Abortion Legal” sign. Frame 6. At last! All is explained! The Third Amendment forbids the forcible housing of military personnel in a citizens’ homes. Its incorporation in the Bill of Rights was a reaction by the Founders to that very practice carried out by the British during the Revolutionary War. The home pictured here is the Brewster House of Setauket, New York, built in 1665. The photo is by Iracaz, shared under a Creative Commons license. The reluctant B&B host is taken from a work housed in the New York Public Library. She is Elizabeth Zane, whose exploits are detailed here; apparently, she was the inspiration for Zane Grey’s Betty Zane (1903), the first volume of his Ohio River Trilogy. Frame 7. The Guttmacher Institute, one of the prime sources of U.S. abortion data, lists state abortion restrictions enacted during the last several years. The old woman in the shoe, it is surmised here, has so many children that she doesn’t know what to do because of these abortion restrictions. She accuses the state of forcibly housing a fetus in her uterus. Frame 8. Prepare for a romp through property law, Dear Reader! (Remember, don’t go to law school.) We apply this question: when can someone else be in your home? In this frame, the fetus is compared to a guest who has been invited, but is now being asked to leave – as is acceptable at common law, under which guests of property owners or tenants possess relatively few rights. The scene shown, for those who came of age after reruns of The Jeffersons ceased, is of Mr. Jefferson ejecting Mr. Bentley. The dialog, however, is taken not from The Jeffersons, but from The Spellbinders Collection. Our thanks to Ed G. for suggesting this source. Frame 9. On the other hand, perhaps the fetus is more like a tenant delinquent in rent payments and now facing eviction, as shown in this 1892 painting, Evicted, by Danish artist Erik Henningsen. This image is in the public domain. This comparison highlights the uncompensated nature of women’s labor: the fetus, after all, gives no consideration in exchange for housing – and neither does the state that imposes abortion restrictions. Frame 10. We move on to trespassing. Harrison Ford, as President James Marshall, spends most of Air Force One (1997) playing hide-and-seek with a deadly group of planenappers. When Gary Oldham (“Ivan”) is finally in the president’s clutches, he is violently pushed off the plane. We show the classic line in a still from another scene (in which the president growls, “Leave my family alone!”). The true scene of Ivan’s end is here. It is worth mentioning that property owners are discouraged from using self-help to eject trespassers; since the president had no sheriff accessible, he can probably be forgiven for taking matters into his own hands. Whether the fetus is trespassing on the pregnant person is an interesting philosophical question. However, given that almost half of all U.S. pregnancies are unplanned, it is fair to say that in many cases, the fetus is present against the pregnant person’s wishes. Frame 11. Even a person who comes on the land without the owner’s permission may gain some property rights. A prescriptive easement is granted when a person takes adverse possession of the land: their use of the land is open, notorious, and hostile. That is, they use the land openly and against the owner’s wishes, continuously over the course of a statutory period defined by the state. At the end of this period, they are granted an easement to be on the land. In Michigan, the statutory period is fifteen years. Therefore, we show a fifteen-year-old fetus establishing a Disco in Utero. Even if she is there without her mother’s permission, may she invoke the law in continuing to occupy the space, operate strobe lights and loud music, and dance all night? Confirmation of the Michigan fifteen-year statutory period led to immediate thoughts of a prenatal quinceañeras celebration. Alas, there is not room here to explore this idea; the concept will have to be set aside for another cartoon. Forewarned! Please note that this image is the only instance in this cartoon of a visibly pregnant person. That is because 65% of abortions in the U.S. are carried out by eight weeks’ gestation, before most pregnancies have begun to show at all. 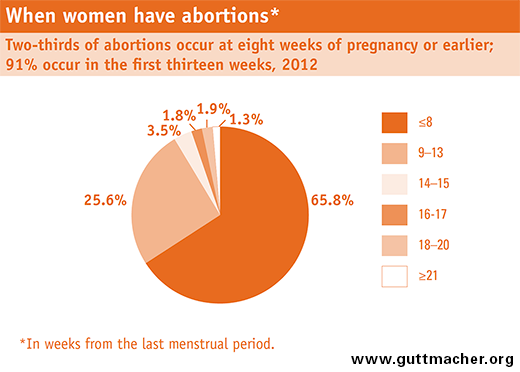 In fact, 91% of all abortions are carried out by thirteen weeks, still very early in a typical 40-week pregnancy. We felt that a fifteen-year gestation, on the other hand, really demanded a visibly pregnant person. Frame 12. The final frame shows a 1787 painting of the Hartley family, by Henry Benbridge. We discovered this painting on the blog 18C American Women, maintained by art historian Barbara Wells Sarudy; we later tracked it down to the collection of the Princeton University Art Museum. The ladies of Family Hartley are declaring their autonomy and personhood as an explanation of why an analogy of the fetus to an occupier of maternal land must ultimately fail. To separate pregnant person and fetus as conflicting entities – occupier and occupied – is tempting but unsound. As explained by the authors of Laboring On: Birth in Transition in the United States, mother and fetus constitute a bonded dyad. A fetus is neither property nor a legal person, but a potential person. Women are not houses, airplanes, or discos. The fetus is not their possession, but part of them. The reason that pregnant people are the best decision-makers about abortion – or childbirth, for that matter – is that they are the experts. They hold close to their hearts the interests of their families, present and future, their own lives, and their many other responsibilities. Your cartoonist expresses gratitude to SMV for inspiring this cartoon through his persistent complaints of the sad neglect of the Third Amendment in both U.S. jurisprudence and high school government classes. Categories: law, reproductive justice | Tags: abortion, cartoons, Equal Protection Clause, Michigan law, property law, slavery, Third Amendment | Permalink.